A new cocktail bar for the East End, Sprout brings its chilli crab pop-up back to the Central Market, Spaghetti Crab becomes Spaghetti Meatballs, Bowlsome CBD prepares to launch, more good news for MOJO kombucha, and Fork on the Road returns. Sprout's chilli crab will pop up at the Central Market next weekend. East End café East Terrace Continental is preparing to launch a new upstairs cocktail bar in time for summer. Social media posts have provided a teaser of what’s to come with the venue, named Soul & Sinner, and ETC floor manager Alex Bueti – nephew of café owner Joe Bueti – confirmed to The Forager that it will be in the space previously used for functions and leased to the Moxie pop-up gin bar during the Adelaide Fringe. “Joe just thought, why not have a cocktail bar all year round?” Alex says. Work is still being done on the renovation and fitout of the upstairs space at 6 East Terrace, but he says it will have a relaxed, speakeasy-type feel, including an extended bar, balcony seating and couches. It is expected Soul & Sinner will serve house-crafted cocktails, as well as shared-platter-style food. The space can accommodate around 70 people when used for functions, but the bar capacity is likely to be less because of the new furnishings. There is no set launch date, but it is expected to be open before Christmas. Seafood lovers will be handed a bib and crackers and encouraged to “dig in and get messy” when the popular Chilli Crab Shack by Sprout returns to the Adelaide Central Market for next weekend’s Seafood + Sounds. The crab pop-up is run by Sprout Cooking School, and director Callum Hann says around 640 crabs were sold during last year’s inaugural event. “We sold out and then had to go and source a whole heap more crab and that sold out, too,” he tells The Forager. This year the Chilli Crab Shack will be located in Stall 8 next to Central Market Flowers, open from 11am until 9pm on Friday, October 5, and from 10am-3pm on the Saturday (you can book here). For $20, diners will be served Spencer Gulf blue swimmer crab cooked in a chilli tamarind sauce with egg noodles and Thai herbs. Hann says Sprout’s chilli sauce is made with fresh green and red chillies, ginger, garlic and tamarind, to give it a sweet and sour flavour. As the name suggests, Seafood + Sounds – which takes place across October 5-6 – is a showcase of South Australian seafood and music, with other dishes available to try including seafood paella from Comida, seafood vol-au-vent from Les Deux Coqs and white wine mussels from Samtass. There will also be fish-filleting and cooking demonstrations, live blues and jazz music, and The Dive Bar. Meanwhile, in North Adelaide, “one-dish wonder” restaurant Spaghetti Crab is about to switch its one dish – from crab to spaghetti meatballs. The team from Ruby Red Flamingo opened Spaghetti Crab at the end of May at 47 O’Connell Street, serving what restaurant writer Nigel Hopkins described as an extremely messy but also very delicious dish of spaghetti in a thick tomato sauce with chunks of whole crab and chopped fresh chilli. Spaghetti Crab was always only going to be a short-term thing, and it was announced this month that Carmela Ventura’s dish would cease being served on September 29. Now, we’re told it will be replaced with Spaghetti Meatballs, based on a recipe by Carmela’s husband Vic, Ruby Red Flamingo’s co-owner. “We had such a great response to the Spaghetti Crab concept that we thought it was only fair to roll out my signature flavour – the sauce, the perfect spaghetti, and the tender meatballs will have come straight from my family’s table to your plate,” he says. Spaghetti Meatballs will be open for “a limited time only” from next Thursday. Fork on the Road organiser Joe Noone is bring the popular food-truck event back for a sixth season, with vendors both old and new set to converge on Unley’s Orphanage Park for the first gathering of spring next weekend. The cutely named When Unley a Fork Will Do will take place between 11am and 4pm on October 6, featuring 25 food trucks plus SA craft beer, wine, cider and spirits, live music and kids’ entertainment. Noone says he’s received a number of applications from new mobile food vendors, and those at the Unley event will include Humpty Dumplings, the South African street-food-inspired Afri-disiac and Bracegirdle’s. More than 60 Fork events have been presented over the past five seasons, and season six will feature range of locations, with an emphasis on partnering with metropolitan councils. The new Adelaide CBD offshoot of Henley Beach health-food restaurant Bowlsome is set to open to the public on October 10, with The Forager told it will offer a range of breakfast bowls as well as the business’s first sweet bowl. The city Bowlsome will be located at 12 Franklin Street, next to Public CBD. Bowlsome is owned by interior designer Danielle Elia (who is also co-owner of Public with husband James Anthony), and it started with her vision to reimagine the traditional salad bar. Customers have the choice of selecting their own bowl ingredients – layered, not tossed – or choosing from a menu of “chef-curated” bowls. While the menu for the Franklin Street outlet is still being finalised, the Henley Beach Bowlsome currently offers bowls with proteins such as diced sashimi tuna, cinnamon and star-anise-braised lamb shoulder, cumin and pepper fried tofu, and sous vide chicken. “Base” ingredients include coconut rice, curry quinoa and turmeric cauliflower rice, plus there is a range of fresh seasonal vegetable options and seasonings. 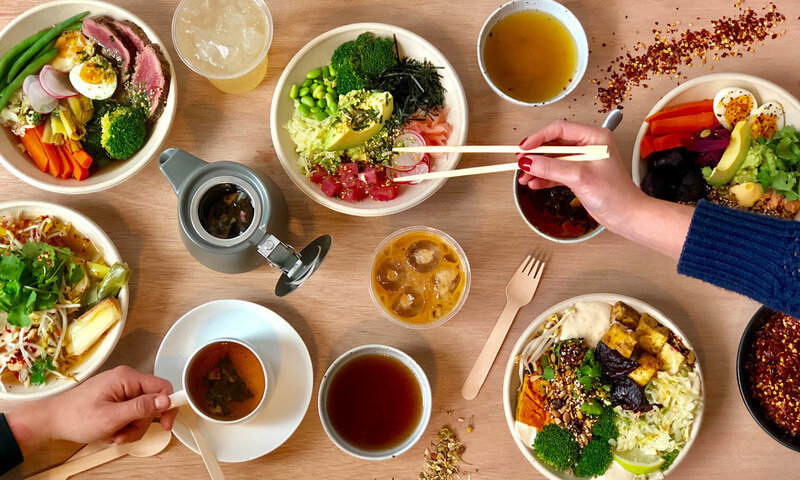 Bowlsome CBD will open at 8am (three hours earlier than the Henley Beach outlet), serving breakfast (such as a “green bowl with 62-degree egg” and “coconut yoghurt bowl infused with MCT tonic”), lunch and dinner, as well as the new sweet bowls. 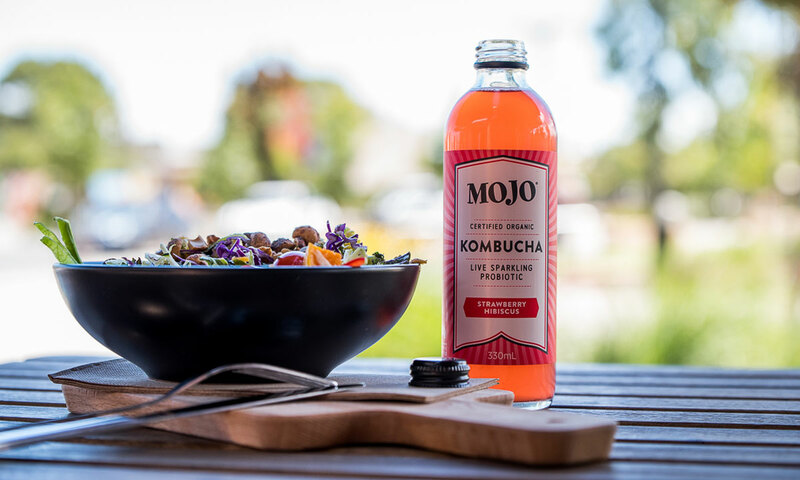 Willunga-based MOJO Beverages, which announced last week it had been bought out by global drinks company Coca-Cola, has won four awards for its kombucha at the Royal Agricultural Society of NSW’s Sydney Royal Fine Food Awards. It’s the first time the awards have included a kombucha category, and Mojo scooped two silver medals (for its MOJO Classic – Perfect Passionfruit, and MOJO Classic – Ginger Tonic) and two bronze medals (for MOJO Classic – Raspberry Passion, and MOJO Crafted – Strawberry Hibiscus). Another SA-based company, Barossa Fine Foods, scooped multiple awards in the Sydney Royal Taste of Excellence awards, including three Champion in Show Awards — for its Roast Porchetta, Smoked Wagyu and Kalbs Liverwurst. MOJO CEO Anthony Crabb says the addition of a kombucha class in the Sydney awards is “yet another sign that Australia is embracing our products”. MOJO-crafted kombucha is a low-sugar, live-culture organic drink made from fermented sweet tea which Anthony and wife Sarah originally started making in their backyard shed and selling through local farmers’ markets. Their company – which is named Organic & Raw Trading but trades as MOJO Beverages – now employs more than 60 people and is sold in 4000 outlets throughout Australia. Anthony Crabb told InDaily last week that the recent acquisition by Coca-Cola would see the business further expand and provide a jobs boost for the region.